A marquee matchup in Week 1 against Auburn lived up to the billing, but Washington, which opened at No. 6 in the polls, came out on the wrong end of the hotly contested Pac-12 vs. SEC matchup in Atlanta. While the 21-16 loss is certainly not an eliminating setback for the College Football Playoff, that result narrows the Huskies' margin for error considerably moving forward. The first home game of the 2018 season pits Washington (0-1) against a much different opponent than the defending SEC West divisional champion. North Dakota (1-0) is coming off a disappointing 3-8 finish in 2017 and embarking on Football Championship Subdivision independence in 2018. "It all comes down to details when you're playing evenly matched teams. It's going to be decided by just some really big-time plays by a couple individuals," Washington head coach Chris Petersen said in his postgame press conference in Week 1. "We'll get some things tightened up." Washington exchanged blows with Auburn, but suffered a handful of miscues -- in particular, a mistimed option by quarterback Jake Browning in the red zone and a late-game breakdown in blocking on the Huskies' last-gasp effort. Despite some struggles, however, Petersen said he was pleased with facets of Browning's Week 1 effort. "It's easy to cast stones sometimes at that position, and you've got to see what he was looking at [when evaluating game film]," Petersen said. "He threw some nice balls in there and he was poised on occasions. "The first interception that Jake threw on the scramble, a protection bust, and he had to scramble out of there," Petersen also noted, referencing Browning's areas for improvement. "He should have thrown it out of bounds; don't make a bad play worse." Saturday's contest at Husky Stadium presents Washington opportunities to solidify a few facets of its game plan, particularly on offense, before going on the road for another marquee matchup. The Huskies open Pac-12 Conference play on Sept. 15 at Utah, another defensively stout opponent with hopes of a league championship. In the meantime, North Dakota comes to Seattle off a blowout win over Mississippi Valley State last Thursday, dominating on the defensive side with a minus-27 yard rushing yield. "We rushed the passer better [in the second half]," said North Dakota head coach Kyle Schweigert. "We tightened up the coverage some, and were able to sack them." The Fighting Hawks racked up seven sacks in the win. RB Salvon Ahmed showed some explosiveness as the change-of-pace option to feature back Myles Gaskin. Ahmed tallied 36 yards on five carries against Auburn. Expect a heavier workload against North Dakota. WR Ty Jones emerged as a potential big-play threat to fill the void created when standout Dante Pettis left. Jones averaged 25.7 yards per reception on his three catches, providing a nice counter-punch to primary target Aaron Fuller. LB D.J. Beavers played a key role in Washington's rush defense against Auburn, racking up eight tackles. Beavers and returning starter Ben Burr-Kirven combined for 21 tackles as the Huskies allowed just 3.3 yards per carry on the day. DT Shane Bowman perhaps answered the question of who would fill the void left by NFL draftee Vita Vea. Bowman had a sack against Auburn and demonstrated an explosiveness off the line that complements the space-eating size of fellow interior lineman, Greg Gaines. 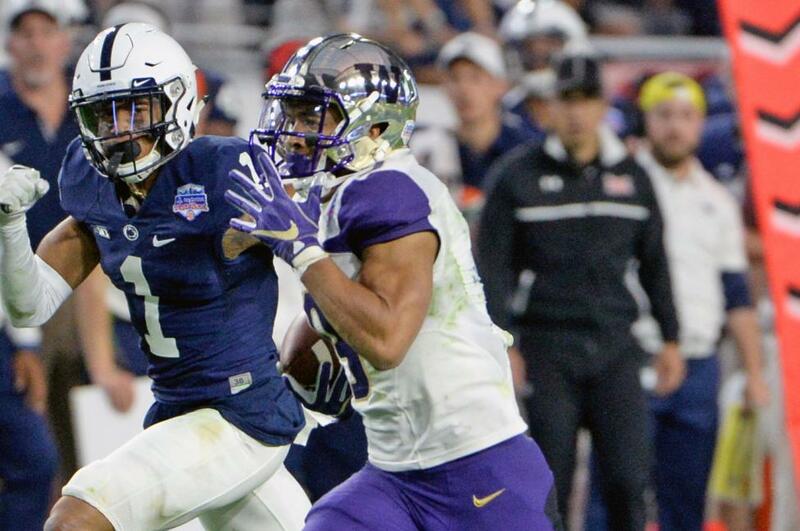 RB Myles Gaskin set the Washington career rushing record against Auburn, passing Chris Polk with 4,130 yards. He is 139 yards behind Ka'Deem Carey and 170 behind Stepfan Taylor for eighth and seventh, respectively, among Pac-12 players all-time. OT Trey Adams is questionable for Saturday's game due to a back injury.